By GreenEyedLillies on May 23rd, 2009 . Filed under: Baby, Kids . This is a must have for your little princess! She has all the hairbows, but where does she put them? What better way to not only store her bows/clippies, but to also embellish her room! These bow holders are so cute, they are sure to be a hit with any little girl. They would make great gifts and shower presents as well! 6 inch wooden plaque (Your choice of circle or oval shape) hand painted with your choice of colors and embellished with a 3D cupcake made of foam! 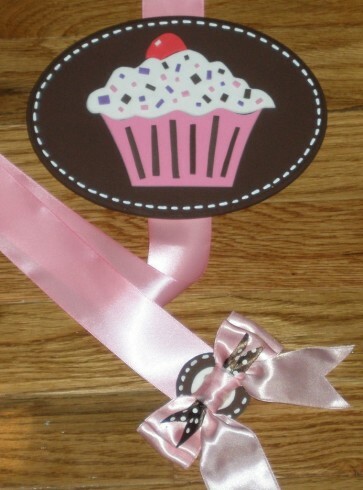 Wooden plaque is adorned with a 30 inch double layer ribbon to clip all of your bows onto! It is finished off with a bow perfectly placed here and there! Your choice of paint colors and ribbon/bow colors. Cupcake will be made to coordinate. Please convo me with your specifications!! Check out this seller’s other listings to see what other kinds of custom bow holders she can make you! Available at Ella Bella Babytique. « ~saint cupcake~ cupcakes giveaway!! Heya, Merely wanted to show you that your website is not loading properly on my i phone. Do you know if there may be some setting I have to use to make it show properly? Almost everything is out of line. What would all of us do devoid of the marvellous thoughts you share on this web site? Who else has got the persistence to deal with important topics for the health of common subscribers like me? I actually and my pals are very lucky to have your site among the ones we generally visit. It is hoped you know how much we enjoy your efforts! Best wishes from us all. Good quality storie, it’s real amazing. I did a search on the theme and found mainly persons will agree with your blog. Thank’s for you notify. My own site about best remote controlled helicopter.I consider you made certain good points in features also.